Allowing your visitors to book your services online is very convenient. You don’t have to spend a lot of money or effort to add such functionality to your website. Chauffeur Booking System for WordPress can help with that. It is designed with limo services in mind. You can specify routes available and different service types. Chauffeur for WordPress allows you to specify minimum and maximum rental time of your vehicles. You can allow distance, hourly, and flat-rate services for your routes. PayPal, Stripe, and cash payments are accepted. 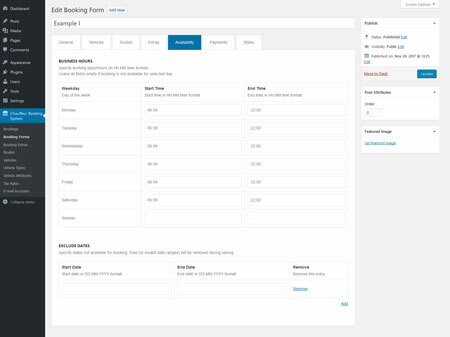 In the back-end, webmasters can edit submitted bookings, change their status, and view all the relevant info. Chauffeur has a responsive layout ready for Retina displays. It supports unlimited bookings, vehicles, and predefined routes.